For other uses, see Cricket (disambiguation). The Crickets were an American rock and roll band from Lubbock, Texas, formed by singer-songwriter Buddy Holly in the 1950s. Their first hit record, "That'll Be the Day", released in 1957, peaked at number three on the Billboard Top 100 chart on September 16. The sleeve of their first album, The "Chirping" Crickets, shows the band lineup at the time: Holly on lead vocals and lead guitar, Niki Sullivan on rhythm guitar, Jerry Allison on drums, and Joe B. Mauldin on bass. The Crickets helped set the template for subsequent rock bands, such as the Beatles, with their guitar-bass-drums lineup and the talent to write most of their own material. After Holly's death in 1959 the band continued to tour and record with other band members into the 21st century. Holly had been making demo recordings with local musician friends since 1954. Sonny Curtis, Jerry Allison, and Larry Welborn participated in these sessions. In 1956 Holly's band, then known informally as Buddy and the Two Tones (Holly with Sonny Curtis and Don Guess; posthumous releases refer to the Three Tunes), recorded an album's worth of rockabilly numbers in Nashville, Tennessee, for Decca; the records were no more than mildly successful, and the band did not hit financial success until 1957, when the producer and recording engineer Norman Petty recorded Holly's sessions in Clovis, New Mexico. Holly had already recorded for another label under his own name, so to avoid legal problems he needed a new name for his group. 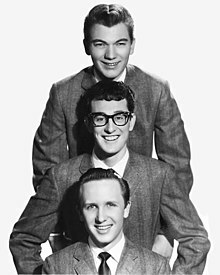 As the Crickets recalled in John Goldrosen's book Buddy Holly - His Life and Music, they were inspired by other groups named after birds. They were then considering insect-centered names, apparently unaware of the Bronx R&B vocal group the Crickets, who recorded for Jay-Dee. They almost chose the name Beetles; years later, the Beatles chose their name partly in homage to the Crickets. The Crickets were lead guitarist and vocalist Buddy Holly, drummer Jerry Allison, bassist Joe B. Mauldin, and rhythm guitarist Niki Sullivan. Sullivan dropped out after a little more than one year to resume his education. The Crickets, now a trio, continued to make stage and TV appearances and recorded more songs, many composed by the band members. Trading card of the Crickets, 1957: (back row, left to right) Buddy Holly, Jerry Alison, and Niki Sullivan; (front) Joe Mauldin. Topps issued series cards featuring movie stars, television stars and recording stars. The Crickets were part of its series of recording stars cards. In 1957 Norman Petty arranged for the Crickets' recordings to be marketed under two separate names. The solo vocals were released as being by Buddy Holly, and the songs with dubbed backing vocals were issued as being by the Crickets. Petty reasoned correctly that disc jockeys might be reluctant to program a single artist too heavily but would play records by two seemingly different groups. Some disc jockeys referred to the band as "Buddy Holly and the Crickets", but record labels never used this wording until after Holly's death. In 1958, Holly broke with producer Petty and moved to New York to be more involved with the publishing and recording businesses. Allison and Mauldin chose not to move and returned to Lubbock. Holly now recorded under his own name with the studio musicians Tommy Allsup and Carl Bunch. Waylon Jennings toured with him shortly after the Crickets folded. Allison and Mauldin looked forward to rejoining Holly after he returned from a winter tour through the northern Midwest. In the meantime, Mauldin, Allison, and Sonny Curtis (a friend and collaborator of Holly's) began recording new songs as the Crickets, with vocals by Earl Sinks. While they were recording, it was announced that Holly had died in a plane crash while on tour. The Crickets, now with vocalist Earl Sinks, went on performing after Holly's death. David Box, a native of Lubbock, Texas, who sang in a manner similar to Holly, joined the group as lead vocalist for their 1960 single "Dont Cha Know"/"Peggy Sue Got Married", released as Coral 62238 after the departure of Sinks. Curtis was not in the band at the time, as he was completing military service. Box, who had left the group in 1960, died in a charter plane crash on October 23, 1964, while touring as a solo singer. In April 1960 the Crickets backed the Everly Brothers on their first UK concert tour but were not billed as their backing group. By 1962, the Crickets consisted of Curtis, Allison, Glen D. Hardin and Jerry Naylor. That year, the Crickets' version of the Gerry Goffin–Carole King song "Don't Ever Change" (Liberty Records), featuring Naylor on lead vocals, reached the top five in the British single charts. Also in 1962 they released Bobby Vee Meets the Crickets, an album with Bobby Vee on lead vocals. For their 1962 UK tour, Allison was temporarily out of the group because of commitments with the U.S. Air Force. 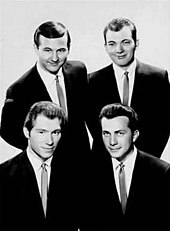 In 1963, the Crickets hit the UK top 40 twice more, with the singles "My Little Girl" and "Don't Try to Change Me", the last of their recordings to reach the charts. The band continued to record. In 1964, the Crickets issued their version of the surf rock song "California Sun" for their album of the same title. In 1970 Jerry Allison and Sonny Curtis performed backing vocals for Eric Clapton for his first solo album titled Eric Clapton. Personnel changes were made over the years, with Curtis and Allison remaining relative constants. For the 1971 album Rockin' 50's Rock n' Roll (which consisted mostly of remakes of Holly-era material), the group consisted of Curtis, Allison and Doug Gilmore. For the 1973 album Bubblegum, Bop, Ballad and Boogies, the lineup featured Curtis, Alison, Hardin and bassist Ric Grech. Steven Krikorian, later to record as the new wave artist Tonio K., joined the group as a vocalist shortly thereafter, as did guitarists Albert Lee and Nick van Maarth, replacing Hardin. The 1973 album Remnants and the 1974 album A Long Way from Lubbock featured the sextet of Allison, Curtis, Krikorian, Grech, Lee and van Maarth. In 1978, the award-winning film The Buddy Holly Story, starring Gary Busey as Holly, presented an engaging but inaccurate depiction of the band's early years. Allison and Mauldin's names were altered to Jesse Charles and Ray Bob Simmons, respectively, to avoid legal action due to their rights being sold to another film production that was also working on Holly's story. Niki Sullivan, Sonny Curtis, Bob Montgomery, Don Guess, and Larry Welborn were not portrayed in the film. The Crickets appreciated the film, but gave a thumbs down review and Allison was outraged by his fictional counterpart Charles' attitudes: vulgar, racist, alcoholic, and profane. The Crickets released The Crickets and Their Buddies in 2004, featuring classics from all parts of their career, with performances by several prominent artists, including Eric Clapton, Rodney Crowell, Waylon Jennings, Nanci Griffith, John Prine, Graham Nash, and Bobby Vee. The album was produced and mixed by Greg Ladanyi and included editing and additional mixes by Dave Carlock, Rob Hill, and Rogers Masson. For the album, the Crickets officially consisted of Allison, Curtis and Mauldin; former members Albert Lee (guitar) and Glen D. Hardin (keyboards) also played throughout, and one-time member Steven Krikkorian (now known as Tonio K.) was the lead vocalist on two tracks. On October 28, 2008, the Crickets were inducted into the Musicians Hall of Fame and Museum in Nashville, Tennessee. They performed "Peggy Sue", "Not Fade Away" and "That'll Be the Day" at the ceremony, accompanied by guest guitarist Keith Richards. In 2011, Allison was still touring with Sonny Curtis, a childhood friend and bandmate of Holly's, on vocals and guitar. On April 14, 2012, the Crickets were inducted into the Rock and Roll Hall of Fame by a special committee charged with correcting the omission of the band with Holly when he was first inducted in 1986. The inducted members were Jerry Allison, Sonny Curtis, Joe B. Mauldin, and Niki Sullivan. The group was unable to attend the ceremony because Mauldin was ill.
Mauldin died from cancer on February 7, 2015, in Nashville, Tennessee. On February 6, 2016, "The Crickets & Buddies" performed in Clear Lake, Iowa, at the Surf Ballroom, the site of Holly's last performance. Members of previous lineups appeared, including Sonny Curtis, Glen D. Hardin, Albert Lee, Tommy Allsup, Gordon Payne and others. After the show Allison announced that it was the group's final performance. Double Exposure (2015, recorded 1992–1993). 1957 "That'll Be the Day"
1959 "Love's Made a Fool of You"
"When You Ask About Love"
1960 "More Than I Can Say"
"He's Old Enough To Know Better"
^ "Buddy Holly Timeline: 1936 to 1956". Buddy Holly Center. Archived from the original on July 19, 2011. ^ a b c Gilliland, John (1969). "Show 12 – Big Rock Candy Mountain: Rock 'n' Roll in the Late Fifties. [Part 2]" (audio). Pop Chronicles. University of North Texas Libraries. ^ "crickets". Home.earthlink.net. Retrieved July 17, 2011. ^ "The Crickets". Snopes.com. Retrieved February 11, 2013. ^ Persalis, Dave. ""The Beatles: What's In a Name?"". Abbeyrd.best.vwh.net. Archived from the original on June 4, 2011. Retrieved July 17, 2011. ^ a b "Who's Who on the Cricket's Recordings". Rockin50s.com. Archived from the original on February 11, 2013. Retrieved February 11, 2013. ^ "Just a Day Away" (PDF). HubStuff. January 29, 2004. Archived from the original (PDF) on June 15, 2004. Retrieved July 17, 2011. ^ Subrosa Citizens Bureau (November 11, 2016). "Everly Brothers Cathy's Clown 1960" – via YouTube. ^ "Don't Ever Change". The Beatles Bible. December 22, 2010. Retrieved July 17, 2011. ^ "The Crickets". The Crickets. Retrieved July 17, 2011. ^ "Hall of Fame Honour for Booker T". BBC News. October 29, 2008. Retrieved November 6, 2008. ^ " "Buddy Holly Discography". hotshotdigital.com. Archived from the original on September 27, 2011. ^ "CRICKETS | full Official Chart History". Official Charts Company. Retrieved December 19, 2015. "The Crickets". Rock and Roll Hall of Fame.